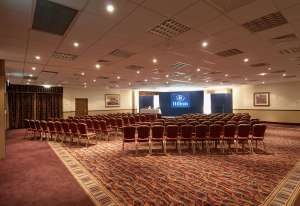 Located on junction 15 of the M40, it's just 20 minutes’drive from Birmingham International Airport to the modern Hilton Warwick hotel. Do business in the 19 meeting and conference rooms, and wind down in Sonnets Restaurant and Caffè Cino Lounge and Bar. De-stress in the LivingWell Health Club, with its pool, or visit nearby Warwick Castle.